A lesson about corporate greed and the power of ownership was instilled when the senator’s beloved team moved from Brooklyn to Los Angeles. The 1957 move of the Brooklyn Dodgers to Los Angeles devastated a generation of young Brooklyn fans. They learned a bitter postwar lesson from team owner Walter O’Malley about the financial promise of the West Coast and the limits of their community affections to sway a man against the allure of riches. The seemingly impossible—the Dodgers’ leaving town—was all of a sudden a brutal reality. The team of Jackie Robinson, Pee Wee Reese, and Duke Snider was westward bound, and only two seasons after the team had finally brought a title home to Brooklyn. It was a disaster. Walter O’Malley, his name remains in infamy. It really was a very deep thing. Because when you’re a kid and the name of the team is called the Los Angeles Dodgers or the Brooklyn Dodgers, you assume that it belongs to the people of Los Angeles or Brooklyn. The idea that it was a private company who somebody could pick up and move away and break the hearts of millions of people was literally something we did not understand. So it was really a devastating moment. I remember it with great sadness. The move from Brooklyn to Los Angeles was the first instance of a trend that continues to this day. Pro-sports owners still hold up communities for stadium money. Billionaires still threaten to leave communities that have supported them for decades, more than willing to break the hearts of fans if they don’t get their share of the public till. Just last season, the San Diego Chargers became the LA Chargers, the St. Louis Rams made the playoffs as the LA Rams, and the Oakland Raiders announced their move to Las Vegas. In the first two cases, it was a ruthless move, punishing cities for not ponying up stadium cash. In Oakland, the city will be paying costs for the stadium for years after the team leaves. And the great city of Seattle still awaits an NBA team. It’s ugly as sin, and Brooklyn was the blueprint. A better way—one I can imagine Sanders supporting—would be for pro-sports teams to be fan-owned in the style of the Green Bay Packers. Or, if public money goes into building stadiums, then the teams themselves would also in fact be publicly owned. That way, any money spent on sports directly benefits communities and fans become not passive participant but stakeholders. This has worked with some European soccer clubs—like FC St. Pauli—and it could work here. But one can imagine that, to use the Sanders lexicon, it would take a revolution. It is easier in fact to imagine free college and single-payer health care than prying the Dallas Cowboys out of Jerry Jones’s hands. But then, without a vision or sense of what can seem impossible, social change, let alone social democracy, is a pipe dream. 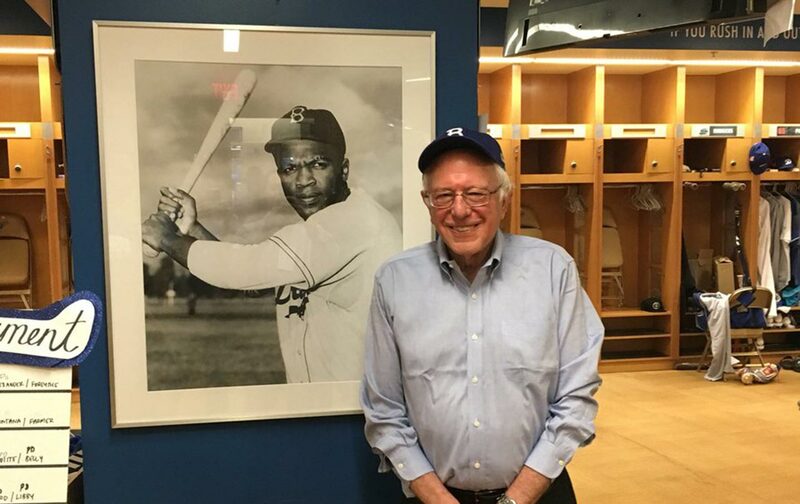 I love that as Sanders left the LA Dodgers facility he had a picture taken of himself in front of a photo of Jackie Robinson. The pic was posted on social media with the following message: “We’re here to bring the Dodgers back to Brooklyn.” If it seemed impossible that the Dodgers would ever leave Brooklyn, then it shouldn’t seem that far-fetched to imagine a world where we can bring them back.